This machine has been specially adapted to achieve high yield with Alaskan Pollack. Fillets are produced with a smooth clean cut due to the careful handling of the raw material. Overall processing costs are reduced by replacing slower and more expensive manual filleting by hand. Mechanized filleting also ensures improved hygiene and safety. 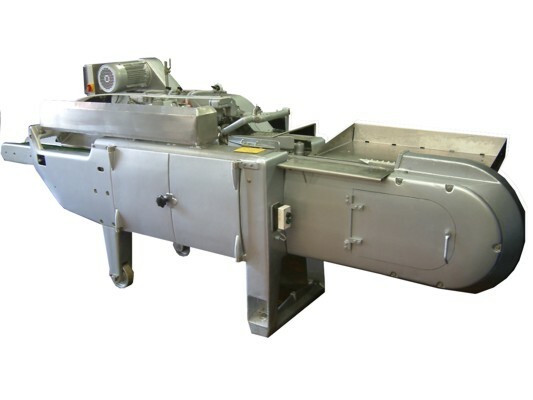 For fish sizes 200 – 400 mm (h&g) with a throughput rate of 24-36 fish/min. This machine is sturdy and durable, having proven itself in processing factories in China. It has high capacity, features easy operation and maintenance, safe functioning and wear resistance. The drive and operation is not complicated – making it an economical purchase.